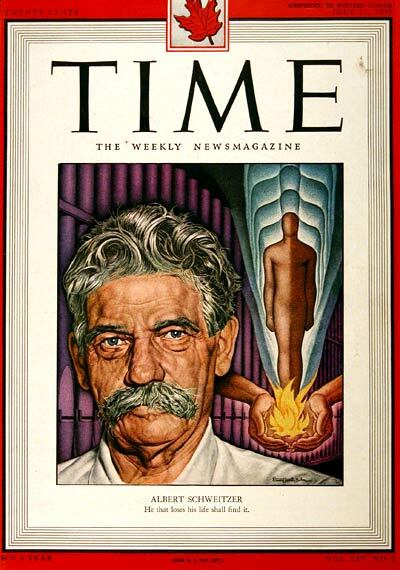 Albert Schweitzer spent the first thirty years of his life doing what he wanted to do. The difference between himself and others, however, is that he stated at a young age that this was his plan: thirty years to explore his own desires and, then, he would "do God's work." Albert was the son of a Lutheran minister and this indubitably had an effect upon his vision for himself and his future. Albert had an excellent education at his father's insistence and urging and profited from it for years to come.In Alsace, where Albert was living the sanctuary was shared equally by a Roman Catholic and Lutheran congregation. The two congregations held their services in the same church but at different times and in different areas of the sanctuary. Albert was steeped in this climate of care and ecumenical theology from a young age. The impact of this cannot be overestimated on the eventual theological pursuits of Albert. Albert is perhaps best known for his early theological pursuits. Of particular note is Albert's contribution to the study of the "Historical Jesus." In many ways, Albert was the end of the early 20th century "Quest for the Historical Jesus" not because people had grown disinterested but because Albert's work--The Quest for the Historical Jesus--confounded the non-Christian side of the argument by demonstrating the historicity of the figure of Jesus as a prophetic and impacting figure. Further, it undermined the liberal Christian side of the argument by suggesting that Jesus was speaking about an impending end-of-days and that Jesus was not focused on liberal political ideals. It was, roughly, at his thirty-year-mark that Albert published this text and began his service to God that he felt compelled to offer. Albert was highly regarded by his colleagues and contemporaries and was described as a theological phenomenon of note. The expectation was that Albert would lead a remarkable career in theology and retire a wealthy, influential, and highly-respected professor. However, Albert surprised everybody when he decided to become a physician and move to what is now Gabon, Africa, to care for the sick and needy. Though he was initially rejected by the missionary societies because his theology was considered questionable, he refused to meet with the committee for a theological inquest.Instead, he met with the members one at a time and convinced them that he was legitimate and his theology was orthodox. Consequently, after learning some of the medical trade, he and his wife moved to Gabon where they would stay for many years. In their first nine months, they would treat over 2,000 people who came from all over the country to receive treatment. As they continued treating patients and healing people from their diseases, they began construction of a hospital to provide for the care and healing of more people all the while being threatened with their lives and multiple attempts at killing them. Albert and his wife, however, were devoted to the people, the place, and the calling. When World War I started, Albert began to have some complications because of his German nationality and working in a French territory. He, eventually, would have his citizenship transferred to France so that he could continue to provide for the people he loved and was devoted to. As he aged, he began traveling to countries throughout the world and speaking about his healing mission in Gabon. He spoke about a reverence for life that entailed a commitment to taking care of all life. This included speeches against nuclear armaments (in his later life) and in favor of healing work in Africa where modern Western medicine could do wonders if only people would give the time and money. He received the Nobel Peace Prize in 1953 for his work on behalf of life throughout the world and, particularly, in Gabon. He was the influential and highly-respected man that people might have predicted him to be but he did it through a commitment to life and his own calling to go into the world offering healing and love.